Learn how Bluleadz uses weekly meetings to focus on the most important client KPIs, make adjustments in real-time, and improve ROI for their clients. What was life like for you before Databox? Brittany: Before using Databox, we were primarily using HubSpot just because we work with it so much. All reporting was done in HubSpot or manually in spreadsheets. It was time-consuming to plug everything in and cross-reference it and dig into different channels to make sure everything was on track month-to-month. Will Polliard (Inbound Marketing Strategist at Bluleadz): Sometimes, a client would request specific data in the middle of the month, and we would need to pull metrics that weren’t readily available inside of HubSpot. We’d have to pull them and put them into a report and that could take anywhere from a couple of hours to a day or two or something like that. How has life changed since you adopted Databox? Brittany: I know clients love it because it helps with transparency. They don’t need to wait for us to get something they need. They’re able to see Databox whenever they want. Will: The increased visibility helps both the client and us internally. When Britt looks at all those dashboards at once, it’s easy for her to make sure that we’re on track to reach our client goals because we’re tracking all of that inside the Databox. Can you tell us a little more about your use of the client performance dashboard? Brittany: In my day-to-day role, it’s something that I check every morning. I’m able to go in and easily see red flags and where things are going really well. It’s a nice quick look every morning to get the top level stuff that I need to see. But I also meet with our strategists weekly and we go through each client on the client performance board and look for numbers in the red or green. We want to know how far off from the goal we are, so we can start fixing it right now. I don’t want to wait until the end of the month or the quarter to see these red flags. How do you run your weekly meetings with account managers? Brittany: We try to make them pretty quick and consistent. We have three strategists right now. The board has all of our clients in order based on the strategist that is assigned to them. I’ll go through every client for each strategist. Then, from that, we schedule separate meetings to go over places where there may be issues so that way we can spend more time on those specific accounts. The account manager comes prepared because they’re checking it as well weekly. That’s really nice because we’ve gotten into a cadence now where they know to do that on their own. How often do you speak to clients? Will: We communicate with our clients on a weekly basis and send over agendas ahead of time. At the top of all those agendas, there is a link to the Databox Databoards. We keep that information front and center. Usually, the weekly meetings are dedicated to checking in and making sure that we’re not far off our goals. Then on a monthly basis, we actually dive into their full month of data. We add some more context to the numbers and actually walk through the key performance indicators that we’re tracking. We explain why those numbers are the way they are. Then we talk about pivoting if we have to pivot, or doubling down on things that are working well. How do you share bad news with the client in the weekly meeting? Will: We found that being as proactive and transparent as possible about reporting is the best way to handle it. We’re always monitoring our progress and communicating that back to the client. So if we are off track on quarterly goals, we will have a conversation with the client in a weekly meeting and come up with solutions to those problems. It’s just worked really well for us. Brittany: I think it’s actually worked in our favor. When we share data on weekly calls, the clients know for a fact that we’re looking at it rather than waiting til the end of the month. Because they look at data every week and they know what we’re doing to work towards their goals, we stay aligned and create a much better relationship. How do you set expectations during the sales process? Will: Everything ties back to the client’s overall business goals. We like to keep our goals as metrics-focused as possible. We try to get the client’s revenue goals and then we’ll work backwards from that. What’s an average deal size for you? How many opportunities do we need to get? What’s the closing rate from opportunity to customer? Then we work backward through the marketing and sales funnel to reverse engineer those numbers and get a clear traffic and lead goals. How do you present that story to them in the sales process? Will: For all of our sales prospects or sales opportunities, we create a kickoff 90-day strategy document. Inside that document, we include all of the goals and the initiatives that we’re going to complete to help them reach those goals. And we have a whole call a dedicated to reviewing all that information with them. On that call, we paint the picture of the initiatives that we can provide that are going to help them reach those goals. I explain how each initiative that we’re proposing is going to help them reach those goals. How did you choose 90 days? Why not six months or a year? Brittany: Part of it is just because the marketplace changes. We want to be agile. If the data is showing that something’s not working, it’s easier to pivot in a shorter timeframe than a whole timeframe. It’s not to say that we aren’t looking at six, nine, 12 months out. We understand their yearly goals and their yearly revenue and that is definitely part of what we talk about. But in terms of aligning the initiatives with those 90 days, we start there as a sweet spot because your first 30 is dedicated to getting up and running and getting to know the client. Then, we dive into their specific goals from there. That way, every quarter we can regroup do a deeper dive of what worked well and didn’t work as well. So 90 just seems to kind of work for us. This seems like a lot to fit on one dashboard. How do you share the data? Will: We have an executive dashboard, which is a high-level overview dashboard that just reports on like super pertinent KPIs that dive into the overall health of our inbound initiatives and how we contribute to our client’s success. And then following that dashboard, we have other dashboards that go into the nitty-gritty and specific marketing metrics. We have some folks that we work with who are really interested in that information. Databox does a great job with the custom metrics and calculated metrics. So if they’re looking for unique reporting that we can’t pull out of HubSpot or Google Analytics straight out of the box, we can plug that stuff in too. Then that way, everybody’s happy and if folks don’t want to get into the nitty-gritty, we can accommodate and not overwhelm them. But for clients who really want to see specific metrics on a granular level, we can provide that level of insight too. 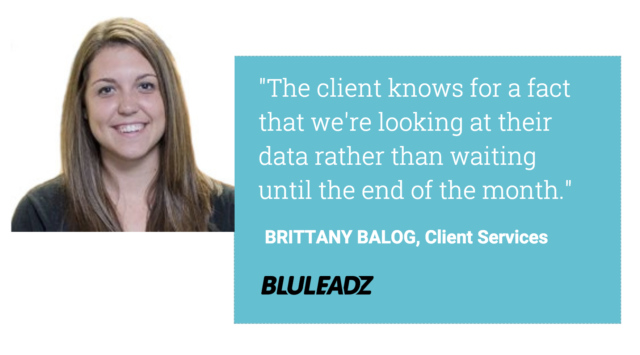 Want to get a firsthand look at how agencies like BluLeadz use Databox to automate their client reports, set client goals, and much more? Sign up for one of our live agency demos. We host them live every day.